The direct-acting SV121 to SV127 solenoid valves consist of a coil, plunger, and sleeve assembly. In a normally closed state, a plunger return spring holds the plunger against the orifice, preventing flow through the valve. When current flows through the coil, a magnetic field is produced and it turns the stop into an electromagnet that attracts the magnetic plunger. This action compresses the return spring, allows the body orifice to open, and permits fluid flow through the valve. The pressure and flow capabilities of the direct-acting valves are limited by the power of the solenoid. 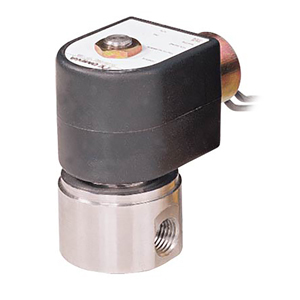 The SV128 is a pilot-operated solenoid valve. It uses the energy stored in the pressurized fluid to actuate the valving mechanism. The valves require the minimum pressure differential specified for proper valve operation. A direct-acting solenoid valve is an integral part of the pilot-operated valve and is used to affect the balance of pressure above and below a diaphragm or piston.